Base made on the Create a Cat Warriors maker by Neikoish on deviantArt. Appearance: Bearfur is a small, compact tom with a twisted front paw, an accident that happened while he was a Warrior Apprentice. Though small, his fur and tail make him look much larger, because of how long his fur is. His eyes are a piercing blue, and he has no scars on his body to speak of. Bearfur is a dark brown tom with a lighter brown underbelly and even lighter brown face, ears, tail, and paws. This makes him look somewhat like a bear. His underbelly marking starts at the end of his neck and ends right before his hind legs. His ear, face, and tail markings all cover the whole area, while only a small area on his feet are covered in the brown markings. Personality: On the outside, Bearfur is a crabby tom who does not have the patience to deal with cats who act like whiny kits. He tends to stay away from the rest of the clan and would rather not have an apprentice, but knows that he has to. He acts like he is above mostly everyone due to his position as medicine cat. On the inside, Bearfur is actually very nice. Once you break through his outer walls, you can see the true medicine cat. Calm, polite, and kind. He treats his friends, and the kits of the clan, like they were his mates or kits. He does not let a lot of people see this side of him, however. History: Bearfur was born to Swiftbreeze and Mintclaw as their only kit. He had a normal kithood and dreamed of being a Warrior some day. When he was around eight moons old, he was practicing his fighting moves when he tripped over a boulder and twisted his front paw. He was quickly taken to the medicine cat, who did all that she could to fix his paw. But sadly, it could not be fixed, and the then Bearpaw had to give up his warrior dreams for becoming a Medicine Cat. He trained hard, even if he did not like it. Once he got his medicine cat name, Bearfur, he begain working full-time, as his mentor had retired to the elder's den soon after he became a full medicine cat. Appearance: Badgerclaw is a nearly pure-black she-cat with long fur and medium length whiskers. She has a white stripe of fur running from the top of her head to the middle of her tail. Her eyes are an amber color and her nose is pink. She has many scars. There is a long scar on the right side of her flank, and three short scars on her muzzle. Her ears are nicked, as well. On her left ear there is a nick on the right side and on her right ear she has nicks on both sides. Personality: Badgerclaw is a vicious yet caring she-cat. 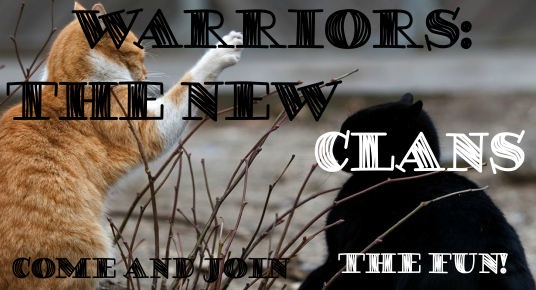 She cares for her clan's safety, as the Warrior Code states, but in a fight, you can tell all she sees are the enemy cats and red. She hates to lose, so she always tries her hardest to succeed. She dreams of being the leader one day, and hopes to fill that dream very soon- thought she would not kill her leader to do so. Instead of being quick and agile, she is a fighter. History: Badgerclaw was born to Rockfang and Bluefoot on a cold Leaf-bare night. She was a small scrap of fur and the medicine cat did not think she would live. She had a stronger sister, Leaftooth, but no other siblings. As the two kits grew, they both became Warrior Apprentices. They then became warriors. In their first fight with another clan, Leaftooth ended up sustaining fatal injuries and she died, leaving Badgerclaw alone. Appearance: Acornpaw is a small, lithe tom with perpetually messy yet fluffy dark brown fur and bright, orange tabby stripes. All four of his paws are white and both of his ears have nicks in them. His eyes are a bright blue and his nose is a soft pink. Personality: Acornpaw is highly secretive. He does not like to talk much, but he does care for his clan. He likes having his relationship with StarClan because it makes him feel special. He looks at the others as if they were his family. And considering his past, it would be best if it was kept that way. He can be fierce when needed, but does not like to fight much, which explains his choice in jobs in the clan. History: Acornpaw was born to Mossfur of StemClan and an unknown loner. The loner left Mossfur and the newly born Acornkit in StemClan to defend themselves. This left a rift in the trust between the Clan and Mossfur, and everyone looked down on Acornkit. By the time Acornkit was to be apprenticed, it was decided that he would be a medicine cat apprentice. Parents: Mossfur (alive) and an unknown loner. ...Erin Hunters sounds like a group that hunts down people named Erin. Appearance: Crowpaw is a small, fluffy black she-cat with bright blue eyes. Her paw tips and chest are white while her muzzle and legs are silver. Her tail is long and fluffy, also being black. Her paw pads and nose are a dark pinkish-red. Personality: Because of how she was raised, Crowpaw is a very scared and jumpy she-cat. Crowpaw is very quiet and secretive. She does not like fighting, but would protect MapleClan with her life if needed. She hates to be called small, even though she is. She looks up to a lot of cats within MapleClan, even if it does not look it. History: Crowpaw was born to two unknown loners and basically left at MapleClan's doorstep. The rest of her life is kind of boring, though.